Starting with a photograph is a great way to encourage kids to imagine, write, discuss, think and express themselves creatively. Lots of photo editing software has features that allow you to manipulate photographs, but there are also some great online photo editiors. Like Tuxpi. Make your pictures more lively, apply fancy effects and create real eye-catchers with this collection of easy to use photo effects. The picture editor is browser based, very simple to use and all tools can be used either separately or be combined with each other. It's a clear, uncluttered interface, one of those websites that sticks to one job and does it well. Uploading your photo is a simple matter of choosing where you have it stored on your computer (upload local file tab), which brings up your picture on an editing screen. Or you can add the url of a picture you've found online. 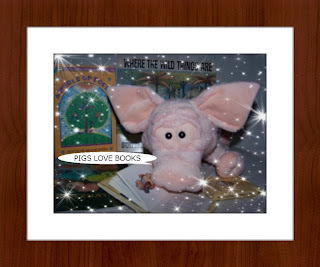 Effects include motivational poster, collage, tiles, stardust (that's where my pig acquired the bling! ), and all sorts of frames. In editing, as well as choosing effects, you can add text as in my example above. This makes Tuxpi perfect for one of those occasions when you want your kids to engage in some quick writing. If you change your mind about an effect, it's a simple matter of going back to "picture effect" (top left) and trying something else. Once done, you download to your computer. Fast and easy! This is cute. I agree about my kids being pretty easy to photograph. They are pretty cute. HA! This is so much fun! The kids will love altering photos in this way as a writing prompt. I love pictures as writing prompts too, and the idea of kids owning the changes they make to a pic is just icing on the creative cake, to me.